In the SatAM and Archie Comics continuities, Knothole Village (later known in the comics as Knothole City) is the base of operations for the Freedom Fighters, a small band (led by Sonic the Hedgehog and Princess Sally Acorn) dedicated to overthrowing the evil Dr. Robotnik. 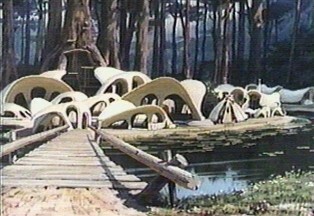 Both series initially depicted Knothole as a hidden village located in the Great Forest on planet Mobius. In the comics, however, it grows into a thriving city that is impossible to keep hidden, and it enters into a state of open war with the Eggman Empire under Dr. Robotnik. Knothole was later destroyed, and the populace was relocated to the city of New Mobotropolis. Located deep within the heart of the Great Forest, Knothole Village is accessible only through hidden entrances at various points in the forest. Originally (as shown in SatAM), it was a hidden retreat for the royal family, who otherwise lived in the capital city of Mobotropolis. When Dr. Robotnik took over and banished the King, he began to round up the citizens of Mobotropolis to be roboticized. Sonic, Sally, and their friends were taken to Knothole by their caretaker, Rosie. Eventually, the group would become the Freedom Fighters and would use Knothole as both their home and center of operations. Mobotropolis, under the control of Dr. Robotnik, was renamed Robotropolis and became a polluted, factory-infested wasteland. In SatAM, it has always been depicted as an above-ground village located deep in the forest (see image above). The heart of the village is the living quarters, small thatched-roof huts where the Freedom Fighters live. In the Archie comics, the home base of the rebel Freedom Fighters was literally underground, accessible through a small tree-stump with a hinged top. A slide leads from the tree-stump down into the extensive underground caverns that form the main control center of Knothole Village. (This depiction, like many elements of the early issues of the series, was based on that seen in the SatAM pilot episode) As time went on, the Archie version of Knothole became an above-ground village to look more like the SatAM version in order to keep a better sense of continuity. After the SatAM series was canceled, Archie continued using this depiction. Much later in the Archie continuity, Knothole developed into a bustling city and has even become the new capital for the royal family. The newly renamed Kingdom of Knothole—capital of the Kingdom of Acorn—was no longer hidden from Dr. Robotnik, as the Freedom Fighters are now in a state of open war against his Eggman Empire. The city even came to include a recreation of the original Knothole, christened Freedom HQ which was constructed for Sonic's birthday, and afterwards served as the Freedom Fighters' base of operations away from the new capital. Unfortunately, Knothole was destroyed in a massive assault by Dr. Robotnik not long afterwards, the city's population having relocated to the newly-christened New Mobotropolis. This page was last edited on 4 November 2018, at 09:13.